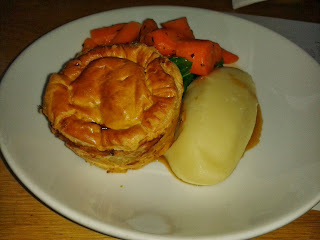 Now I don’t normally focus on non-pie items in restaurants that I visit – we do, after all, like to keep our eyes on the pies on the web’s leading pie review blog! – but there’s something I’ve got to tell you about Canteen, before I even laid my hands on the pie in question. Canteen is a pie reviewers dream! In fact, I’d go as far as to say I have seen the future of pie reviewing in Canteen London, Canary Wharf branch! They offer free wifi* AND power sockets for your laptop, making it the only pie place I’ve been to so far where I could write and post my pie review IN THE RESTAURANT! How cool is that!!! Arriving in Canary Wharf, I couldn’t miss the red and blue signage lining the wall outside the store and it overlooked the ice rink in the adjoining square, making it an ideal choice to warm up with a nice hearty pie after your skating or Christmas shopping! The restaurant is nicely presented and has a nice, lowly lit ambience to it. No school canteen nightmares came running into my head! The pie I chose was the Turkey, Leek and Cranberry Canteen Pie – part of their “Great British Food” campaign. The pie came out well presented with a side of mash and veg. 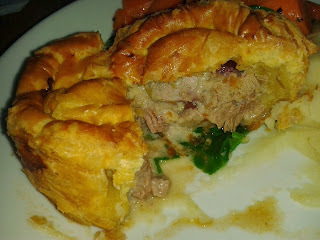 The pie pastry was brilliantly golden – pie perfection and worthy of a 7/7 for colour - and when I cut into the pie it was well filled, pretty much to the brim with very good capacity. This was very much a turkey focused pie, which I for one was not at all complaining about! For me, the meat is the key ingredient in any meat pie – so the more the merrier! The Turkey Pie from Canteen features in our '12 Pies of Christmas’ video! The pie included large chunks of tender turkey were really enjoyable, nice and moist as well due to the gravy (which can be an issue in other pies, as turkey meat is often quite dry). However the gravy was not leaking out of the pie all over my plate, a good sign of the right consistency to keep the pie moist but not overly runny inside. *As a side point, in my opinion it is worth visiting Canteen in Canary Wharf just to ask them what their wifi password is – it made me smile before I’d even laid my hands on the pie! Go on... ask them next time you visit! You can find out what Ashleigh and Olivia thought of the Canteen Turkey, Leek and Cranberry Pie on the Ashleigh Auld website.